The recent Diamond Pet Food recall has left many pet parents wondering whether it’s safe to continue to feed commercial pet food. This particular recall was surprising topet owners who did not realize that Diamond manufacturers a large variety of different brands. As of this writing, 11 brands are involved in the recall, due to possible salmonella contamination. Sadly, recalls have become a fact of life, and they happen in all kinds of industries, not just for pet food. While recalls may not be completely unavoidable, this one is unsettling because it covers so many brands – and because it’s not always transparent who actually makes the brand you’re feeding your cats. 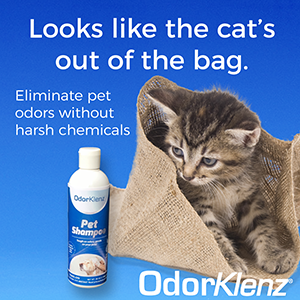 In most cases, pet guardians also have no way of knowing where the ingredients in a particular brand come from. Multiple brands share the same supplier, as we saw in the horrific 2007 pet food recall, which caused the death of thousands of pets who had eaten food contaminated by melamine, which was traced back to a Chinese supplier. As a result, pet parents are looking for alternatives. One such alternative may be to feed food from smaller, responsible companies who care about where they source their products, are directly involved in the manufacturing process, and care about the pets who will eat their products. I had a chance to speak with Carole King, who, together with her husband Norm, owns Pawgevity, a small manufacturer and distributor of raw food based in The Plains, VA. I wanted to learn more about what goes into making pet food the responsible and safe way. Raw feeding can be a viable alternative to commercial dry and canned cat food, and cats, being the obligate carnivores they are, thrive on a raw meat diet. Ironically, raw food is often labeled as “dangerous.” Pet owners are warned to wash their hands, wash dishes and utensils in hot water, and keep the food away from children. Ironically, in light of the recent recalls, which have all been for DRY pet food, these same warnings are now directed at pet owners when it comes to handling supposedly “safe” dry pet food. Carole, why did you decide to start your own pet food company? In 2001, our terrier mix, Russ, died from complications related to a rare form of anemia. The onset of symptoms was so rapid and his passing so quick, that it threw me into a state of shock. I wanted answers as to what went wrong and started devouring everything I could find on holistic care of animals – much of which pointed to nutrition based issues. I’d heard of raw feeding before but it took a fortuitous meeting with a knowledgeable holistic veterinarian to get us started on that path. We transitioned all of our remaining animals – multiple cats and our other dog – and saw what a difference raw food made in their lives and how quickly they became vibrant and healthy. One of our cats, Woody, had lymphoma and lived two years beyond what the conventional vets predicted – with good quality of life and no invasive care. Concurrently, I owned and operated a dog walking and pet sitting service which cared for hundreds of animals. First hand, I could see what they were eating and the problems the foods were causing. I went back to school and became certified as a veterinary assistant to better learn anatomy and physiology. After graduating, I began formulating individualized diets for clients. Without fail, they kept coming back and asking me to make the food for them. Then, the massive recalls of 2007 hit. While attending a major pet food industry conference at that time I realized that no one – not the manufacturers, not the FDA – had known what to test for. And as long as ingredients were being outsourced, they never would. 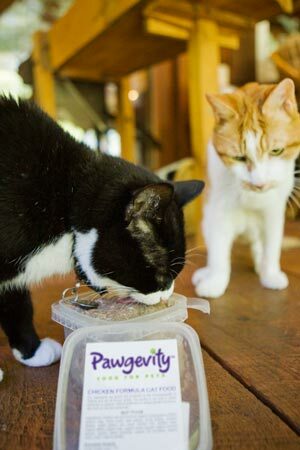 That propelled me into launching Pawgevity – Food for Pets (formerly Chow Now Pet Food) – so that there would be one pet food and treat line out there that people could feel confident feeding to their beloved animals. Can you tell us a little about the manufacturing process? We use the freshest ingredients from local farms here in Virginia – that’s where all of our ingredients come from so that we can ensure safety. Our certified organic produce is often picked the same day it’s washed and prepped for our blends. Our poultry is delivered via refrigerated truck and our lamb is delivered by the farmers that raise them. We’ve partnered with a custom, small human foods facility with an onsite USDA inspector. We’re the only pet food made there because of the quality of our ingredients. On our production run days, we deliver the refrigerated produce ourselves. The production crew does the final mix and multiple grinds, to ensure that the bone is finely ground and all ingredients are easily digestible. We don’t mix runs, meaning chicken production is done on separate days from lamb production. Our food is then hand packed and lids applied by hand, not machine, so it’s not only artisanal food, there are many safeguards in place at each step during manufacturing. What does your safety and quality control process look like? First, because we purchase only from small, pasture-based farms, the animals that go into our food are in the very top healthy condition. They haven’t received antibiotics, chemicals, or medicated feed, and haven’t been raised in crowded, indoor, unhygienic factory farm conditions. We’re proud to say that not one of our animals’ organs have ever been rejected by the USDA inspector – this is an indication of how healthy the animals are. The produce is certified organic and very high quality. One of our farms has provided fruit and veggies for the White House! Our production crew and facility follow all HACCP (Hazard Analysis and Critical Control Points), GMP (Good Manufacturing Practices) and USDA guidelines (and, as mentioned, there is an onsite USDA inspector), and the facility is certified Animal Welfare Approved. This means they’ve gone to great extent to ensure they they do their processing in the most humane manner possible, as well as the safest and most hygienic. They’ve been producing safe foods for humans for decades and handle our food in the exact same way. Everything is kept at low temperatures during processing and immediately fast frozen once packaged. We produce in smaller batches; therefore it’s easier to maintain the highest quality production. The crew chief personally signs off on every case of Pawgevity. We do all of our own transport, in a freezer truck, from our production facility to our retail outlets. We’re involved from farm to bowl, and that’s the best way to ensure safety. Have you ever had a problem during manufacturing? If so, how did you handle it? We haven’t, thanks to our wonderful, caring, and hard working crew. Are small indpendently owned pet food companies a safer choice for pet parents than corporate conglomerates? I can only speak for Pawgevity. We truly care about changing the way the world feeds their pets. We don’t answer to a board of directors, investors, or shareholders – we answer to our own animals and our customers’ animals. It’s not about the bottom line for us. By producing in smaller batches and using only locally sourced ingredients, we’re able to monitor every step of the food production process, in infinite detail, by being directly connected with our farms and our production crew. We feed our food every day to our family. For more information about Pawgevity, please visit their website. Are you concerned about the safety of commercial pet food? Has the recent recall changed what you feed your pets? Sounds like a clean and healthy raw cat food. I appreciate that it’s organic and that the quality control is excellent at every step. I’m big on giving cats raw organic food. Yes, the commercial dry food recalls have concerned me. It’s really Russian (and Chinese) roulette every time a person picks up a bag of dry commercial cat food. Few commercial dry cat foods are organic. They probably have by-product listed as a main ingredient. Quality control is low to non-existent. Who knows where the ingredients came from. And other disturbing facts. Your food sounds great and I’ll talk to my DH about trying it out. Thanks for this-I shudder everytime I hear about a recall and am grateful that it does not include the food that I am feeding them. Savannah, Dr. Lisa Pierson, the veterinarian and author of catinfo.org, can help you formulate a raw diet that is appropriate for cats with urinary tract issues. Visit http://www.catinfo.org for contact information. Is this what you feed your cats? Here in western PA I have access to the most excellent ingredients but there is no local manufacturer, though we do have a good base of people who feed raw. I’ve been trying varieties newly available in local pet supply stores but I am at heart a locavore for food and am hoping a group of us can inspire someone local to manufacture a raw diet in this quality. This is one of the brands I feed, Bernadette. I rotate several different brands, currently, Pawgevity, Primal, and RadCat. I’ve been happy so far with Instinct Raw, which I can buy in a store. I remember Hare Today from years ago and actually ordered, but they quit shipping for a while and I lost track of them. They are about an hour north of me, near where I went to college, not a bad drive at all, so I think I’ll look into them again. Thanks for pointing this out to me–they aren’t in the small and organic farmers’ resources I have on hand for pet food. Bernadette, please feel free to contact us if you’re interested in us shipping to you – we’re in the process of updating our website – info@pawgevity.com or 540-253-5111. Carole, thank you so much for the offer! I’ll send an e-mail with my address so we can determine shipping costs and terms. The recent recall hasn’t, but knowledgeable bloggers such as you and Lorie Huston and Jean Hofvre have convinced me to try feeding raw. It was the only thing Allie would convert to (she was addicted to a dry kibble with grain and refused to try anything else). Since converting, Allie has not vomited once (she had begun to exhibit IBD symptoms). Her coat is amazingly glossy and she has begun to lose a little weight (VERY gradually, of course). I’m so happy to hear Allie is doing so well on the raw food, Lisa! Good luck with the boys. If you were able to transition Allie off of dry kibble with grain, the boys should be easier. WOW….The Plains is only about 20 minutes from us and while we’re not familiar with the company or the food it sounds like a GREAT place to get REAL food for Sam. Thanks for the info Ingrid…..also enjoyed the news that one blog can cause such a stir! 10,000 comments is beyond amazing….congratulations! Thanks, Pam! I bet Sam would love to try this food. Great to hear you’re so close – come on out and visit – we’d love to meet you. We can be reached at 540-253-5111 or info@pawgevity.com.